This is one of the gloomiest places in Moscow, I think. I feel the oppression of the surroundings whenever I am here, and I have been here many hundreds, if not thousands of times over the last 28 years. The heavy, stone walls. The pompous columns crammed into space too small to fit and too high to see properly. The messy pipes and sloppy stray wiring and unused decorative grills. The noise and the arrogance of Tverskaya Street… All of these things influence what I feel when I am here. But there’s a lot more to it than that. 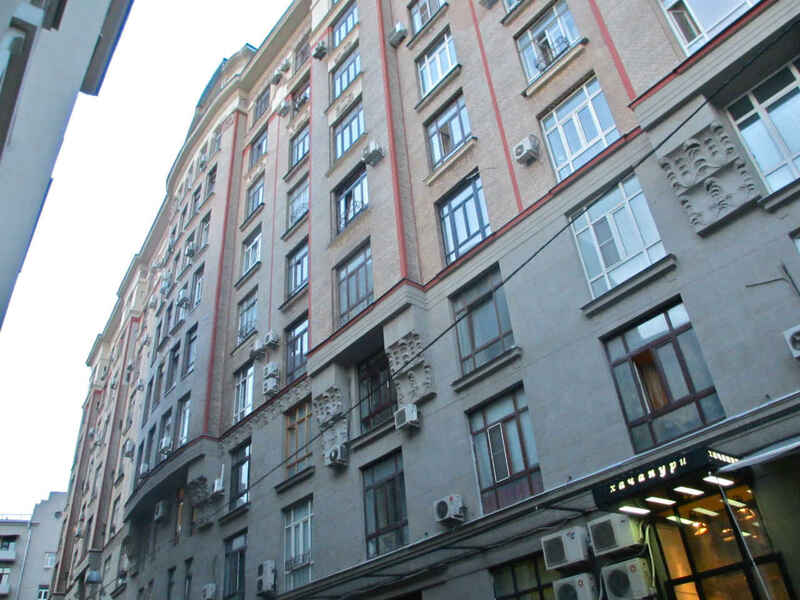 One building away from here is the Tchaikovsky Concert Hall, stolen from Vsevolod Meyerhold before he could build his planned theatre here in the late 1930s, and before he was shot in a Lubyanka basement in 1940. 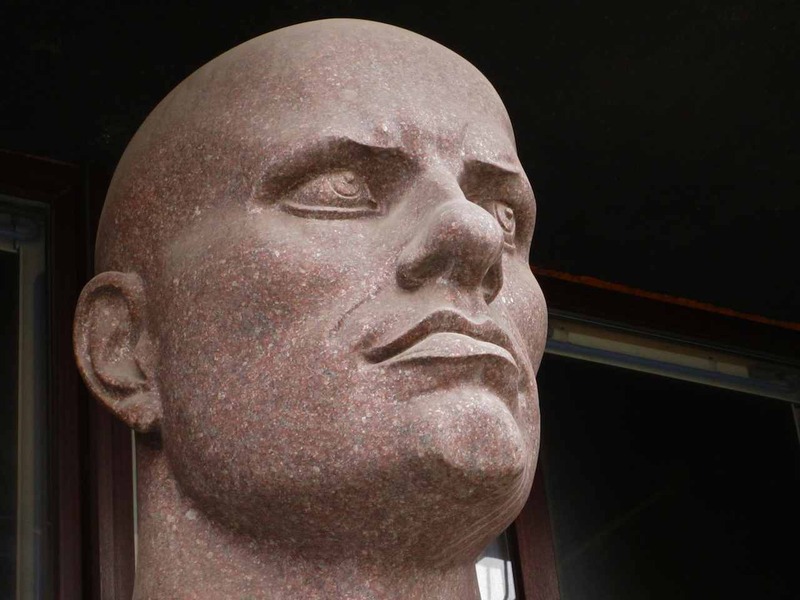 A towering monument to Vladimir Mayakovsky, all bright and bushy-tailed, stands a few hundred feet from here on Triumphal Square – yes, the poet who shot himself out of despair at the age of 37 in 1930. I’ve written about all these places elsewhere in this space. 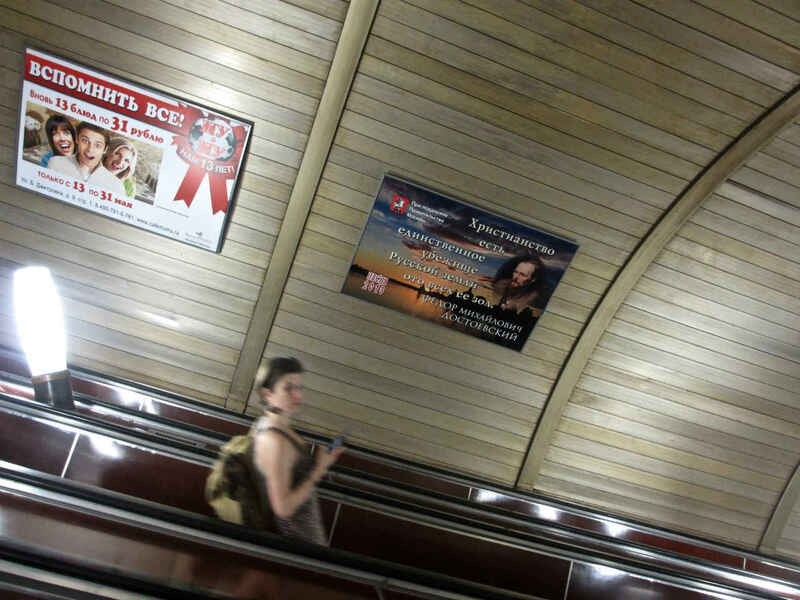 Go to Meyerhold or Mayakovsky or Lubyanka if you’re interested. But there is another reason for the morbidity and despondency that overcome me here. 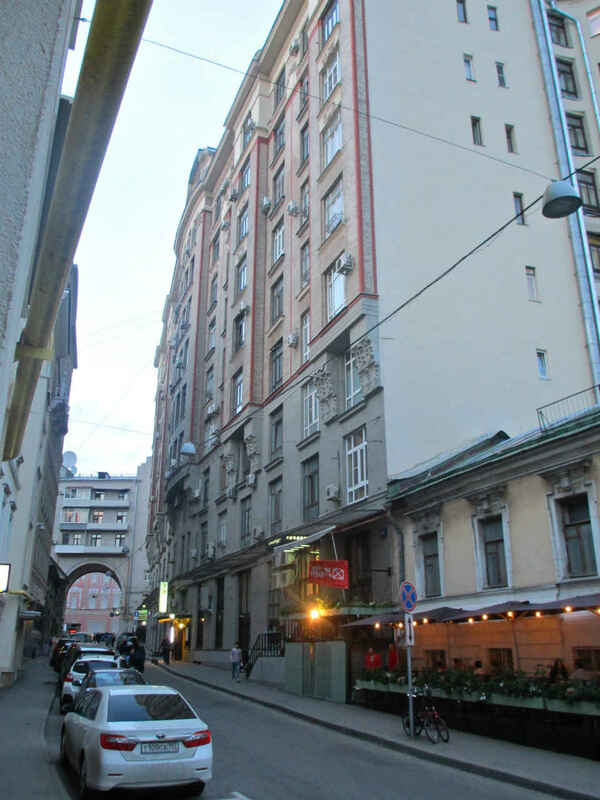 Alexander Fadeev lived here at 27 Tverskaya Street from 1948 to 1956. I’ve written about Fadeev a time or two on this blog, so I’ve already laid out the basic facts of this tragic personality’s biography. It goes from the high hopes and praise garnered by an early novel (The Rout, 1927), to a self-inflicted bullet wound that in 1956 killed the man, an alcohol-soaked, bought-and-sold government functionary at the age of 54. 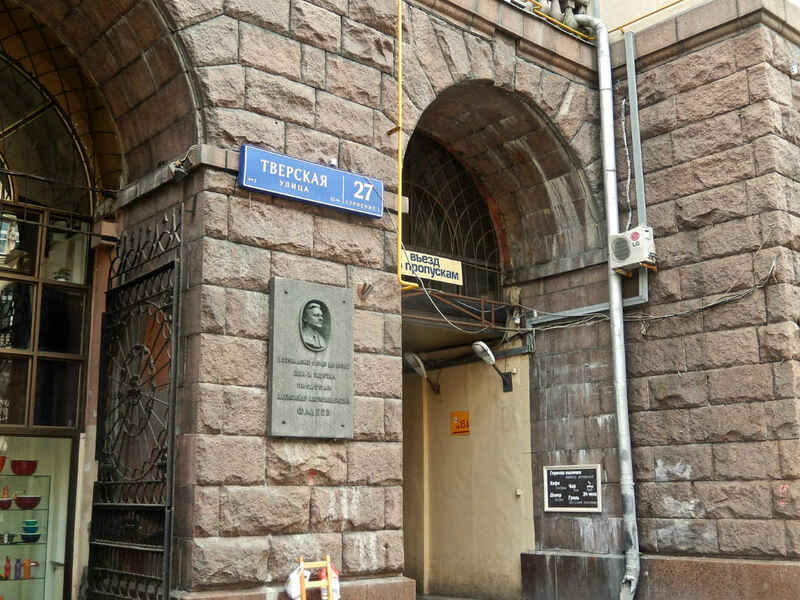 Although this precise spot on the map is not where Fadeev did his final deed – that was done at his dacha in Peredelkino – still, as his last address of record it is closely bound up in his ultimate, despairing act of self-destruction suggesting that conscience had not yet abandoned him entirely. Look at how short a human being’s life is. Consider how little time we have to make our mistakes, take our chances, and reap what we will from that. First major success in 1927. Dead by suicide 1956, 29 years later. Throughout his adult life Fadeev mixed the life of a writer with that of a bureaucrat. He once admitted that he could not imagine life without conflict – it wouldn’t be life otherwise. Even before the publication of his first major novel he played a major role in the creation and running of RAPP, the notorious Russian Association of Proletarian Writers. It was one of the first “cultural” organizations in the early Soviet period that took it upon itself to police and chastise artists who strayed from the Communist Party line. Remaining with RAPP until its dissolution in 1932, he immediately joined the Writers Union and worked his way up the ladder there. That increasingly repressive organization made him one of the most powerful, feared and hated individuals in the Soviet literary world. He was secretary of the Union from 1939 to 1944; the general secretary from 1944 to 1954; and secretary of the board from 1954 to 1956. You will notice that within a year of Stalin’s death (1953) Fadeev was kicked upstairs and that within three months of Nikita Khrushchev’s famous denunciation of Stalinism at the 20th Party Congress in February 1956, Fadeev was dead. 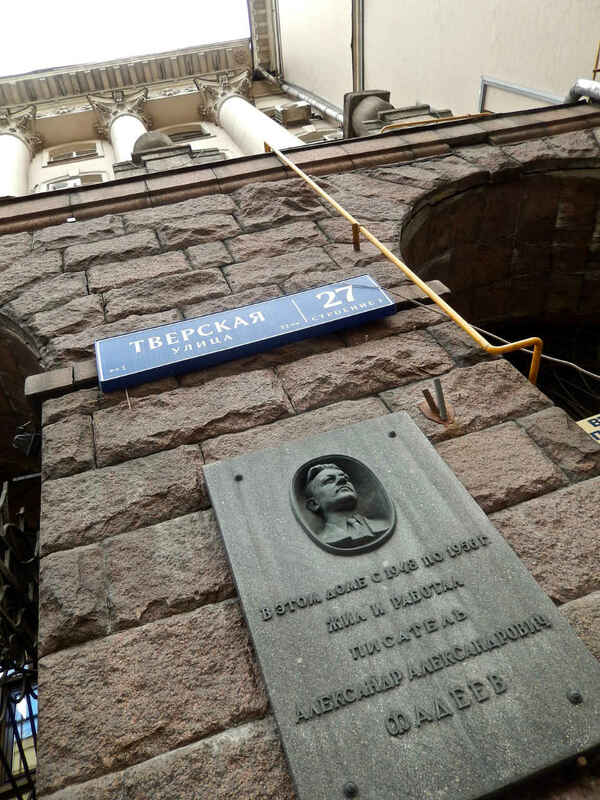 If you like numbers, you will also see that Fadeev moved into the prestigious digs at the apartment building on Tverskaya Street just two years after his most famous novel, the patriotic The Young Guard, was published in 1946. And of messy paradoxes… Let me add one more story from an article by Pavel Basinsky in 2015. Just one month before Fadeev shot himself, the great Russian poet Anna Akhmatova presented Fadeev with a collection of her poetry and signed it, “To a big writer and a good person.” That may be even more bizarre than any of the contradictions wending through Fadeev’s biography. After all, Fadeev was one of the leaders of the so-called Zhdanovism attacks on writers in 1946. He personally called Akhmatova out as a “vulgarity of Soviet literature.” In 1939, doing his bureaucratic duty, he personally banned the publication of some of her poetry. Meanwhile, as a bureaucrat, he helped her find an apartment when she needed one and he even nominated her for a Stalin Prize in 1940. Go figure. But I come back to what I say. 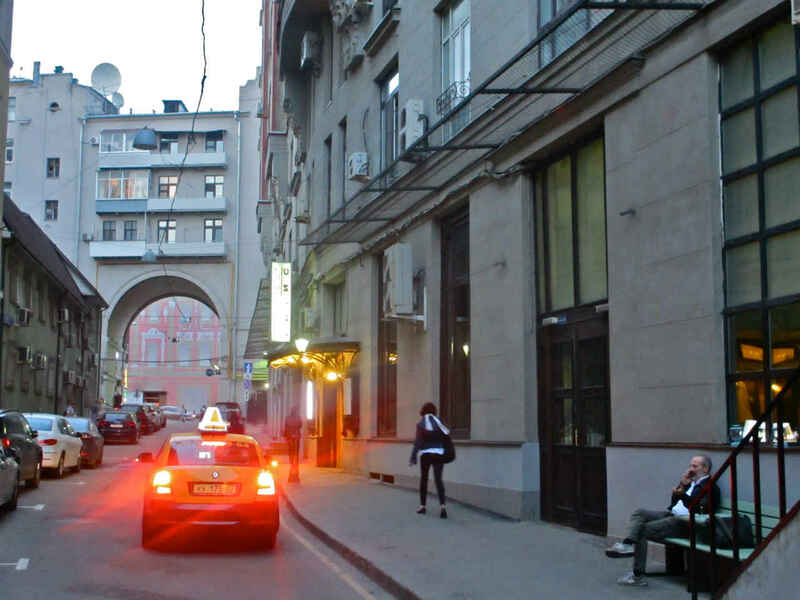 The air around 27 Tverskaya Street is as rotten as it is anywhere in this city. One could write a book about this building. In fact, I used to own a small book about it in one of those libraries I collected along my way before jettisoning as I moved on in life. The way some people are with umbrellas, sunglasses, gloves and the like, I am with libraries. They come of their own, but when I go, they go. 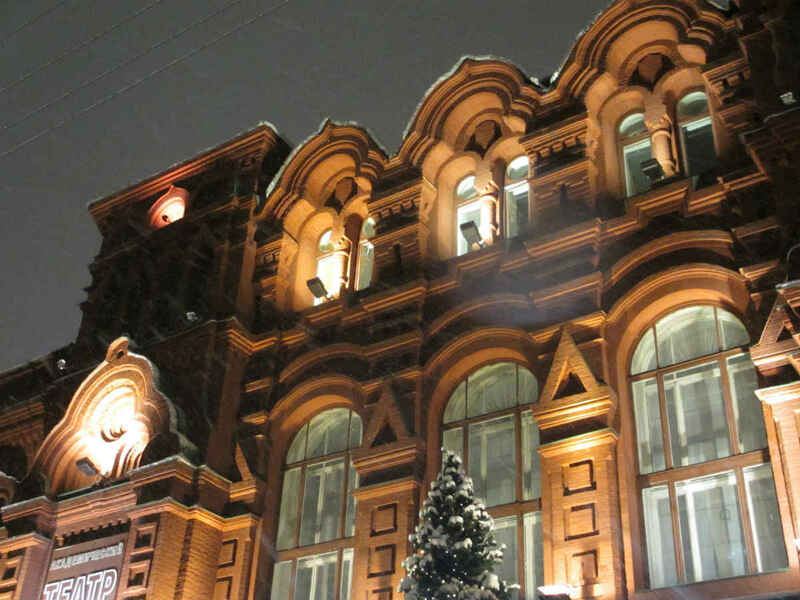 Be that as it may, I don’t need any book to write about his distinctive building at 10 Bolshoi Gnezdikovsky Lane in the center of Moscow. My memories are full without books. This is all very impressive, and I am sure there are plenty of facts and stories out there waiting to be tracked down and retold about all those mentioned here. But I only have room in my mind today for one person and his work and vision. He is not mentioned on either of the plaques from the past, and who knows what eras overseen by what kind of people we have yet to go through in the future? Does anyone today care about Grigory Gurvich? Obviously, many do. He touched the lives of thousands. But does anyone in a position of power and authority remember him? That’s a harder question to answer. Who knows what folks like that are thinking these days. Grigory Gurvich (1957-1999) was utterly unlike anyone else. He came into prominence during the hard, harsh, ugly era of the death of the Soviet experiment, and he greeted it with humor, style and elegance. It was not a particularly friendly time, but Grisha – as I will allow myself to call him – was everybody’s friend. He had a smile, a good word, a handshake or a twinkle in his eye for everyone who ever came through the doors of his theater located in this building. The idea for his theater was a small stroke of genius. 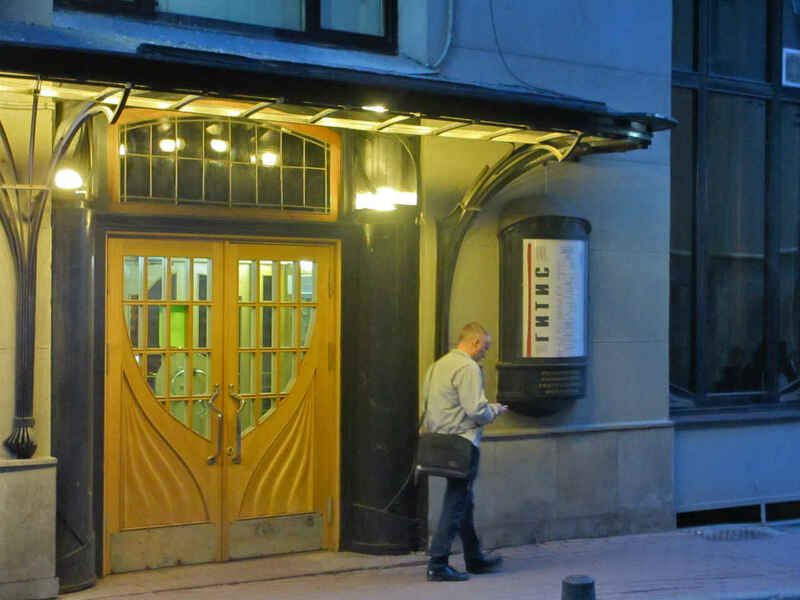 It was not so much a resurrection of the famed Bat Cabaret opened here on the same stage by Nikita Baliev in 1915, as it was an attempt to do that famous enterprise honor in a new age. It was better than a resurrection. It was a whole new theater, with a new idea and a new plan, but one that took inspiration from Baliev and his company which, soon enough, disbanded and headed for world-famous tours of Europe and then a fairly long residency in New York under the name of La Chauve-Souris. (I should mention that Baliev’s name became Balieff in the transition from the Soviet Union to Europe and the States.) 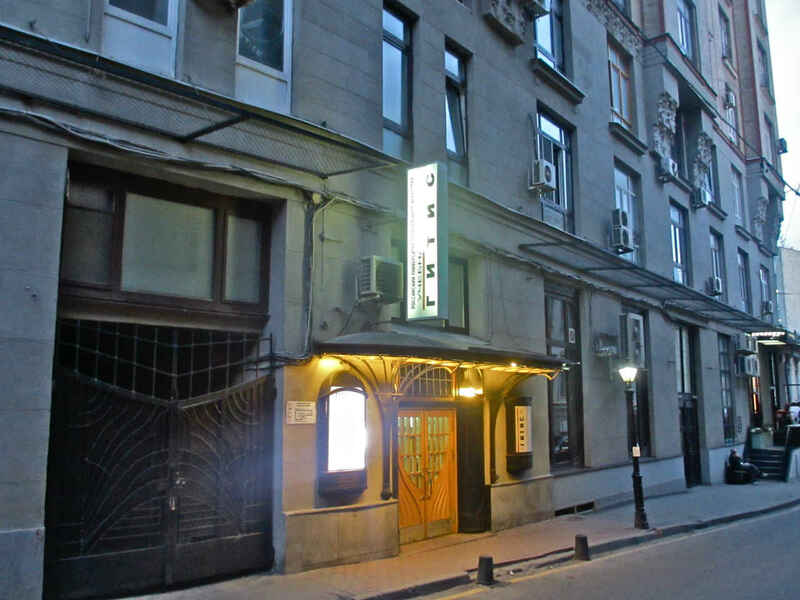 Baliev’s theater was a true cabaret, with actors coming in late nights after performing in the “legit theater” to sing songs and improvise skits with other famous actors, who mingled with the performers from Baliev’s troupe. Opening its doors late at night, when actors and audiences got out of other performances, it would run into the wee hours of the morn. 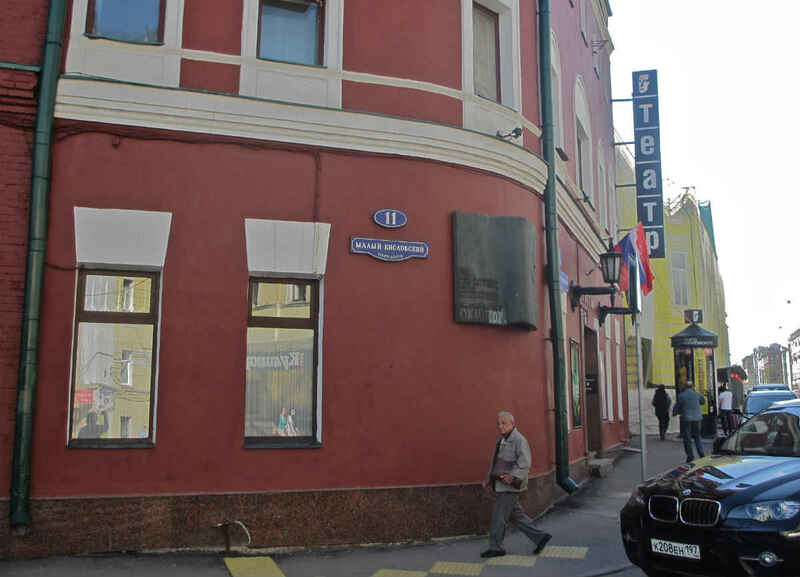 Grisha Gurvich’s Bat Cabaret Theater (note the addition of “theater”) was an actual theater company. 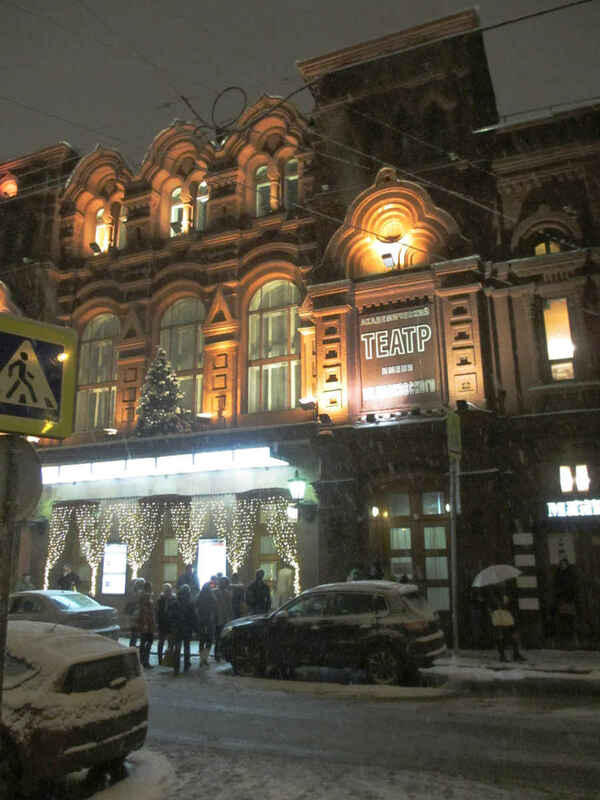 It put on plays and performed them in a repertory schedule like most other Russian theaters might do. What distinguished Gurvich’s work (he wrote or, at least, compiled most of the plays he directed) from other theaters was that each piece was put together from the kinds of skits you might see in a cabaret variety show. But he tied them together, put them into a connected, winding string that created a narrative story. His first show, which opened right here on May 26, 1989, on the basement stage at what has been known over the decades as the GITIS student theater, was called The Reading of a New Play. It was a mystification of sorts that mixed the characters of Baliev’s troupe on the verge of breaking up, with the individuals of Gurvich’s company, which was on the verge of a great beginning. It was nostalgic, sweet, painful, intelligent and always funny. Gurvich, as was his wont, moved through the piece as a narrator or an emcee, tying loose ends together, or, sometimes just leaving them to hang and dangle. The first performances of The Reading of a New Play were wildly successful, as few things can be wildly successful in our days. News of the fabulous new show and theater traveled like wildfire. The next night (when I attended) there may have been two people crashing the door for every seat in the house. The audience was electrified. It exploded into fiery bursts of laughter and applause constantly throughout the evening. “But Gurvich has the ultimate trump card up his sleeve: his own personality. 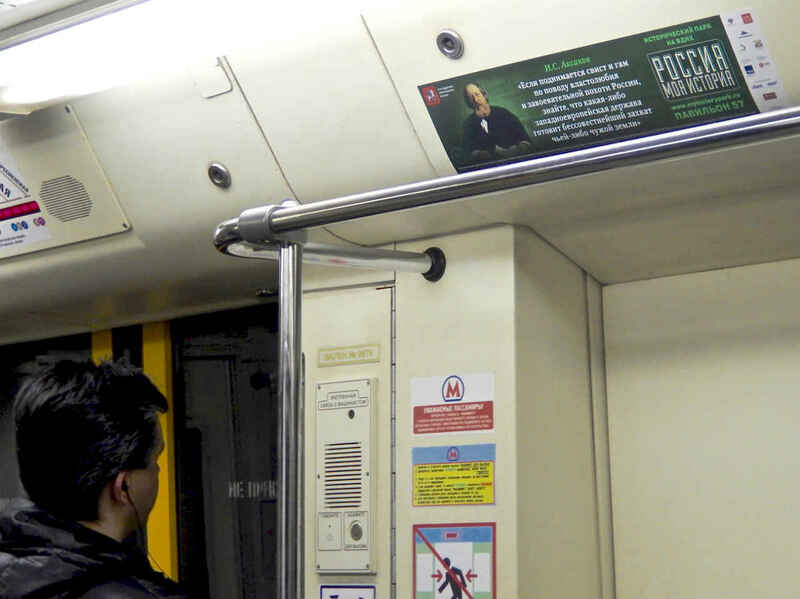 Call him the sultan of suave, the wizard of wit, or the king of charisma, but when he takes the stage to the slinky accompaniment of Roman Berchenko at the piano, he soothes everything over. He isn’t just the show’s author, he is its heart and soul. Meanwhile, amidst the uneven collection of sketches, some are as good as ever. The best include a wildly energetic medley of American pop from Elvis Presley to Chubby Checker; some thunderous, top-flight tap-dancing; and a beautifully-done interactive film skit that has actors climbing onto and off of the screen a la Federico Fellini or Woody Allen. Pleasure, hell. It was an honor. It was the opportunity of a lifetime. It all ended much too fast. 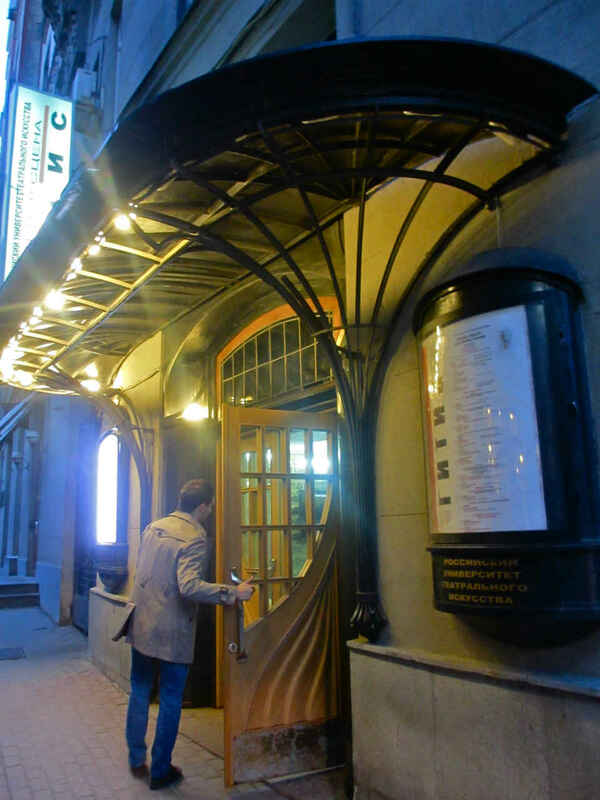 After Gurvich directed five shows in the wonderful old space of the basement stage at 10 Bolshoi Gnizdikovsky Lane, the landlords at the theater – GITIS – kicked Gurvich out. He had become too big a star and, for some reason, they couldn’t handle the competition. Grisha took his company elsewhere; they performed on rented stages around town, but it was never the same. Then around 1996 he became the host of a hit TV show called This Old Apartment. That took most of the air out of what was left of the Bat Cabaret Theater. Moreover, what most of us did not know was that Grisha Gurvich was deathly ill. He died of leukemia in Israel before the century could run out. 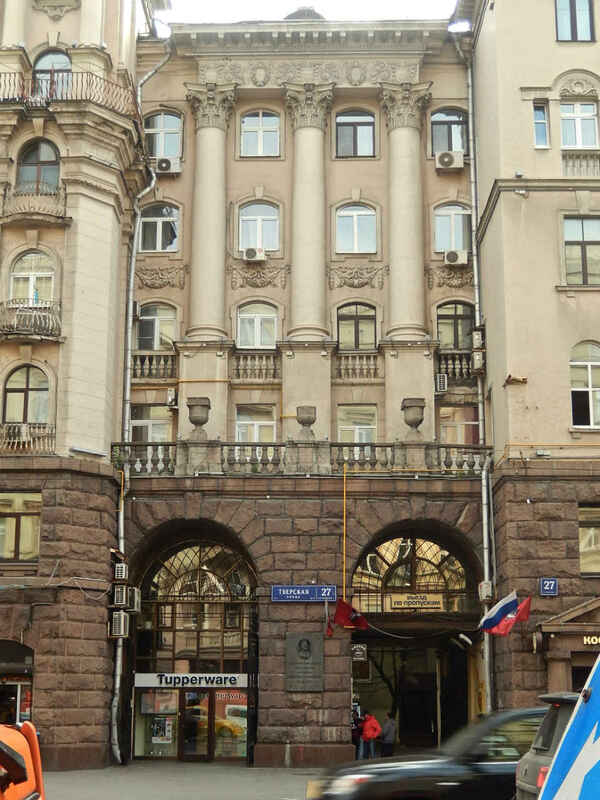 One very visible trace of Grigory Gurvich’s short tenure in this famed building remains for us to see. That is the art nouveau front door and awning that Gurivch had put in before he was asked to vacate the premises. 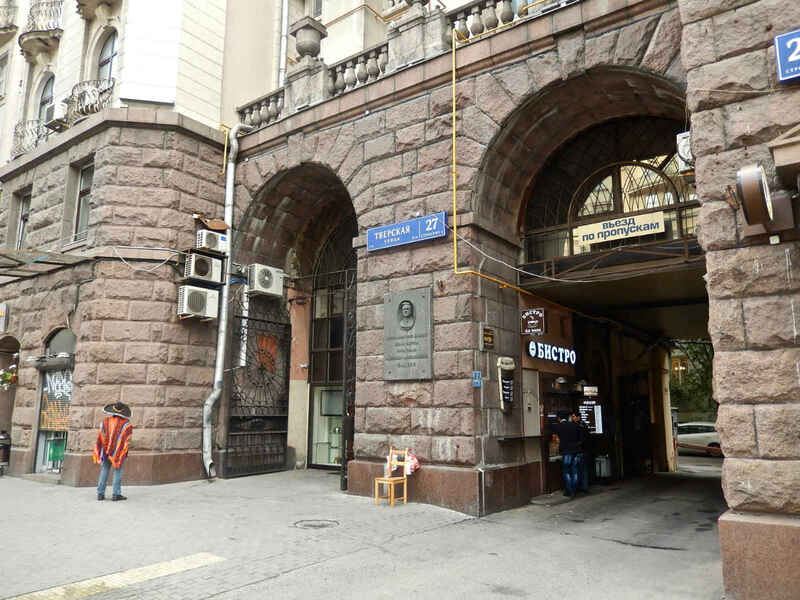 It was his little gift to history – a door erected in the 1990s to honor an era gone by, the last few years before the Russian Revolution. Had Baliev put in a fancy front door to his Bat Cabaret, it might well have looked something like this door that Gurvich had designed and built 80 years later. 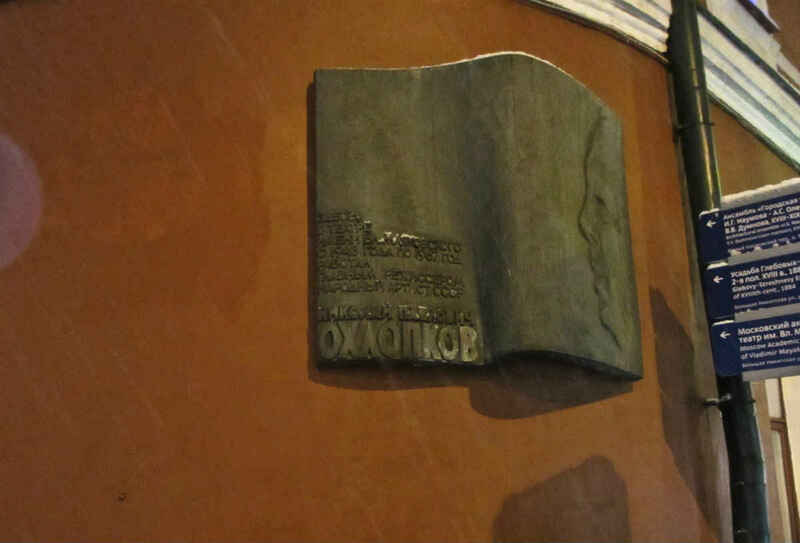 I have tried to photograph the Okhlopkov plaque and the Mayakovsky Theatre several times. I have never liked what I got, now matter what the time of day, no matter what the season. 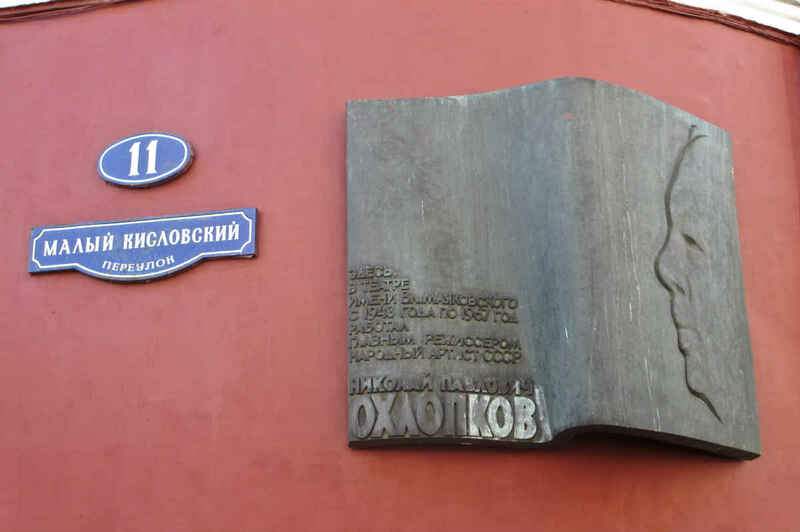 The plaque is an awkward one to get, right there on the corner of Maly Kislovsky Lane and Bolshaya Nikitskaya Street. There are a bunch of street signs in the way, traffic is always humming, people parking where they shouldn’t be, narrow sidewalks leaving no space, electrical wires making a mess of sight angles from a distance, the light and shadows playing nasty tricks. Or maybe this place is just jinxed. One of the times I was photographing here, I noticed somebody shooting me. When he dropped his camera from his face I recognized my friend, the playwright and journalist Mikhail Kaluzhsky. We exchanged pleasantries and went our own ways. Later that day he posted a photo of me on Facebook that made my usually steely nerves begin wobbling like water. Until then I hadn’t known that the beer belly of a person taking a photo increases three times in size – even if you don’t drink beer. Jinxed, jinxed, the place is jinxed! 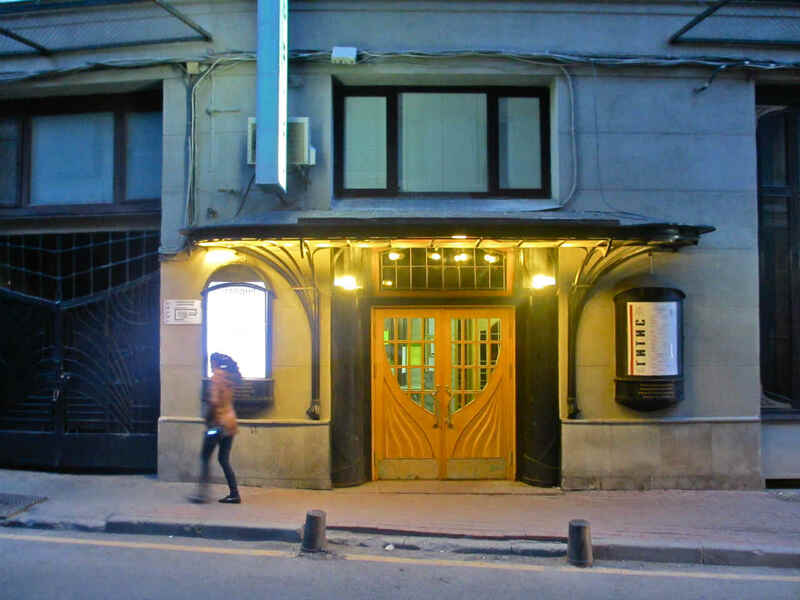 Consider this: Vsevolod Meyerhold took this theater over in 1922 when it was called the Theater of the Revolution, but was gone by 1924, when he moved on to create his own Meyerhold Theater. It was actually here that Meyherhold first expected to stage Nikolai Erdman’s The Warrant, but when he bolted and went out on his own, he took Erdman’s play with him (it eventually premiered in 1925). 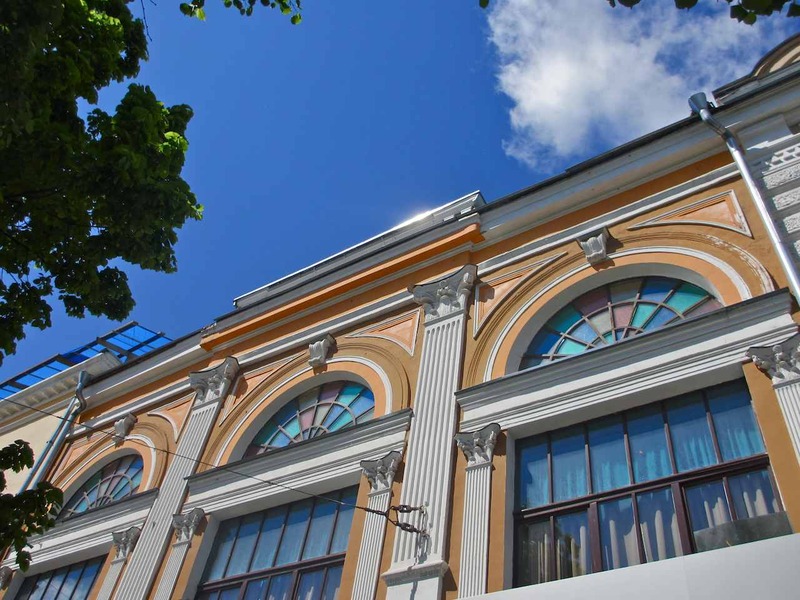 The theater was run by Alexei Popov from 1931 to 1942. 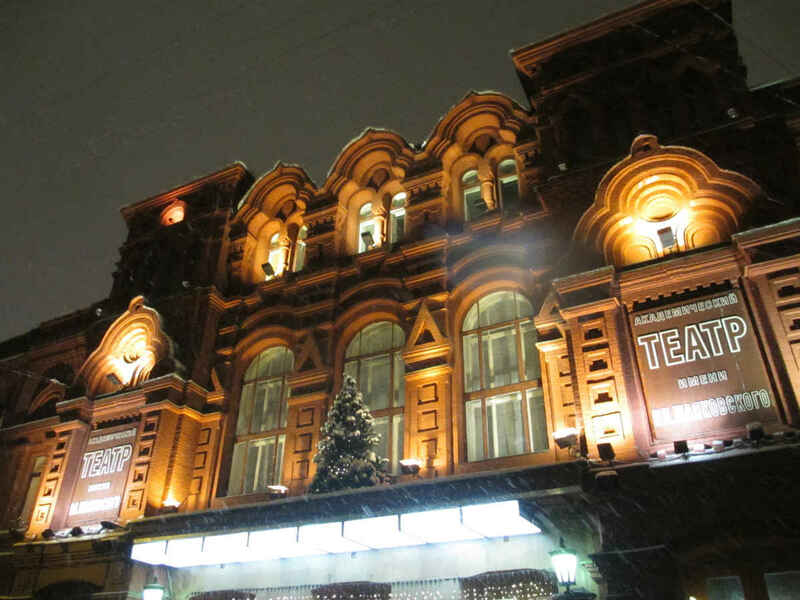 When Nikolai Okhlopkov (1900-1967) took it over it was renamed the Moscow Drama Theater and the year after Stalin died, that is, in 1954, it was renamed the Vladimir Mayakovsky Theater. Okhlopkov remained in charge of the playhouse until it killed him in 1967. Okay, so I’m pushing the jinx thing. Okhlopkov, seemingly out of his league, had a hell of time making Mitya, and he begged Erdman to come south where the shooting was taking place to lend a helping hand. Erdman did travel down as soon as he could, but the problems remained. Again quoting from Kovalova’s essay: “The press noted that the creators of the film got carried away with models of American lyrical comedies in which the main hero, usually someone of uncertain means, constantly becomes the victim of curious circumstances.” Many years later the film director Sergei Yutkevich wrote about the innovative nature of Mitya in his memoirs, but by that time not only was the film long forgotten, it could never be seen again. The only copies had been destroyed. These days we only have the screenplay to judge it by. I found an incomplete copy of it when I was trawling the archives in the late 1980s, but Kovalova came up with the whole thing and published it in her book. It’s hilarious, touching, subtle and – as everything Erdman ever wrote – incredibly well-suited to performance. Why do I linger on this obscure, early episode in Okhlopkov’s life, you ask? Well, here’s why. Because when Stalin died in 1953 and the so-called Thaw got underway a couple of years later, Okhlopkov did what appeared to be a wonderful thing. He reached out to Erdman and offered to stage The Suicide, banned since 1932, and the main cause of Erdman’s arrest and exile in 1933. He payed Erdman an advance and asked for the play script. This was an extraordinary move on the part of Okhlopkov. It would mean the rehabilitation of one of the Soviet Union’s greatest playwrights (Erdman had abandoned writing for the theater, focusing exclusively on writing his own screenplays or doctoring those of others). But it was not meant to be. 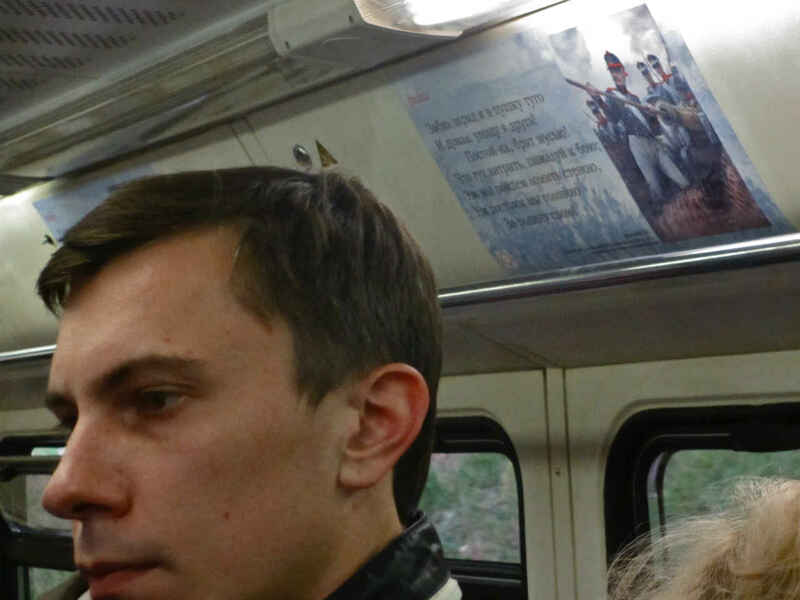 Okhlopkov, having re-read the play, got cold feet. A few other famous “friends” of Erdman also put in their two-bits that the play was “not right for the times,” that it “needed work,” and other such nonsense. That’s when things took a turn for the bizarre. Rather than just quietly let things drop, Okhlopkov pulled a nasty, petty move. He demanded that Erdman return the advance on the grounds that Erdman “did not deliver the play” they had agreed upon. Erdman, who was an extraordinarily calm, even-keeled man, figuratively hit the roof. 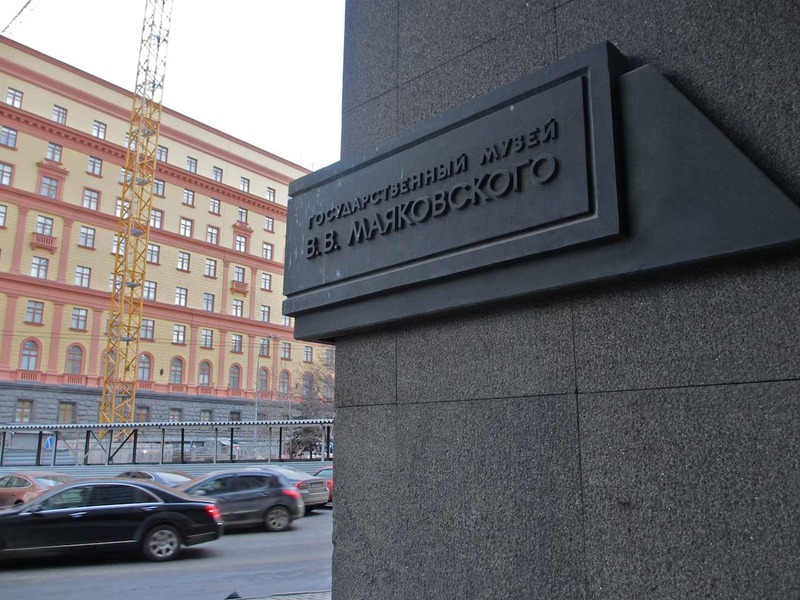 Fury turned to farce, though, when Okhlopkov’s Mayakovsky Theater sued Erdman and sent authorities to his apartment on Tverskaya Street to confiscate his furniture until such time as he would pay up. Erdman wrote a scathing letter to the court, but, as far as I know, he lost that battle. Okhlopkov, after figuratively pulling the rug out from under his old friend’s feet, got his money back. What I don’t know for a fact, but what I strongly suspect, is that following this ugly incident Erdman and Okhlopkov never communicated again. 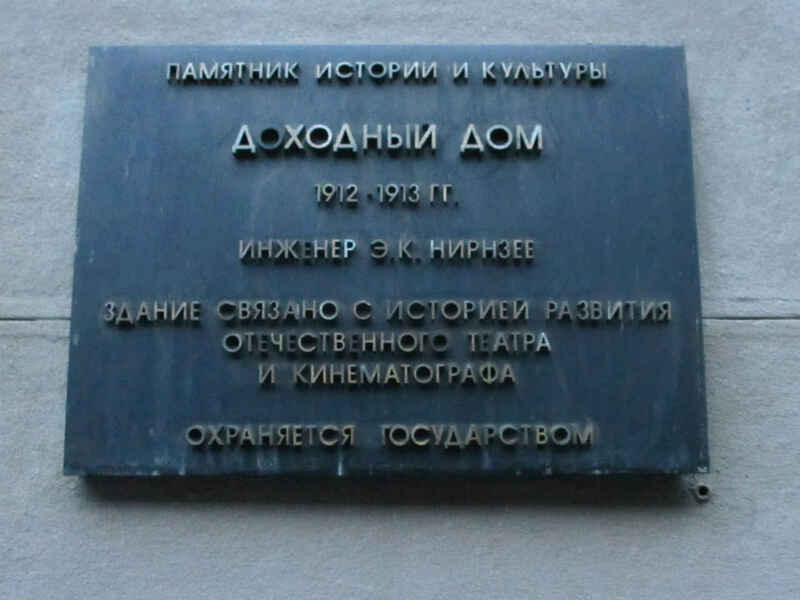 And so, having somewhat clumsily wended my way through this story today, I finally think I have come to understand why my pictures of Okhlopkov’s plaque never come out. I don’t like the guy. He begs Erdman for help in dire times and Erdman comes to his side. Then he goes and sticks a knife in his old friend’s back 30 years later. And that, folks, is why I can’t get any decent photos in these environs. The place isn’t jinxed, but I have no love for it. And, as anybody knows, you can’t do anything of value without love. These photos are the best I’m going to get. Click on photos to enlarge. 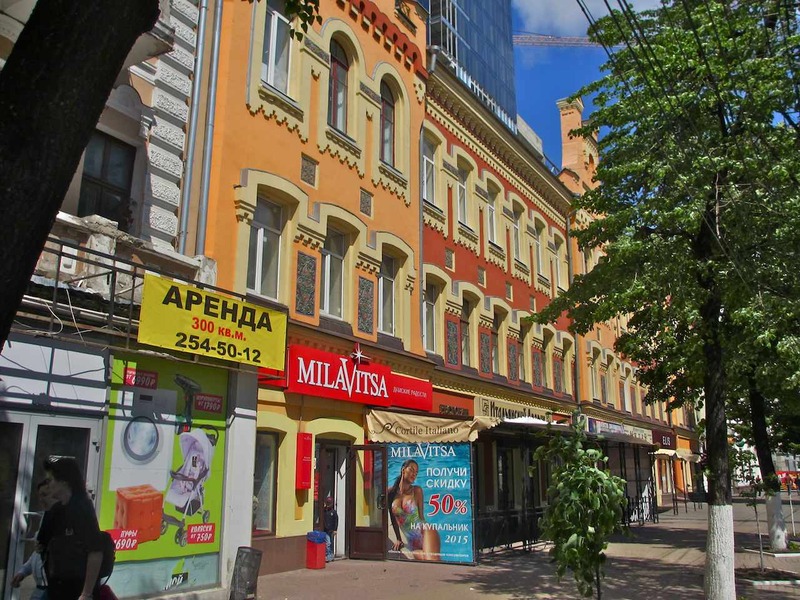 If you happen lose yourself in your thoughts as you walk down the main drag in Voronezh you might be excused for thinking at a certain moment that you had taken a wrong turn and wound up in some Mediterranean or even Caribbean resort. 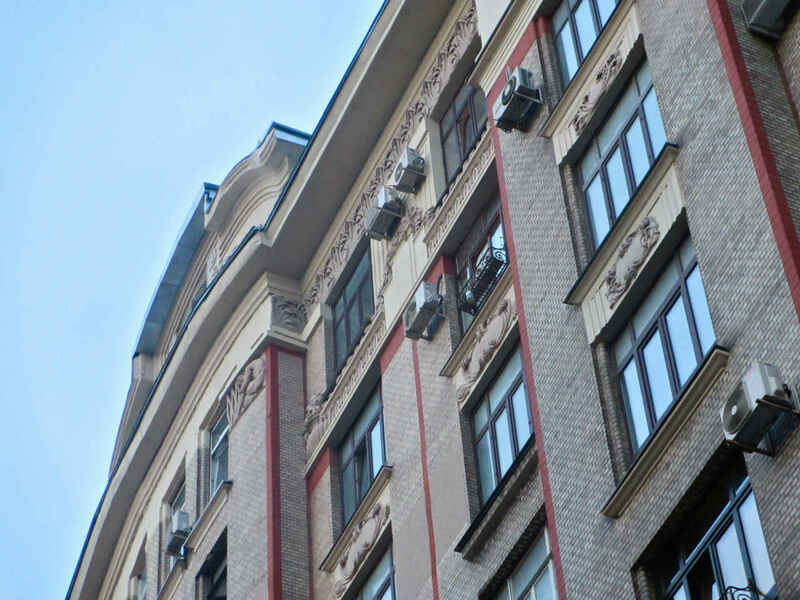 That would happen as you look up at the three-story building at 42/44 Revolution Prospect (formerly Bolshaya Dvoryanskaya [Grand Nobility] Street). 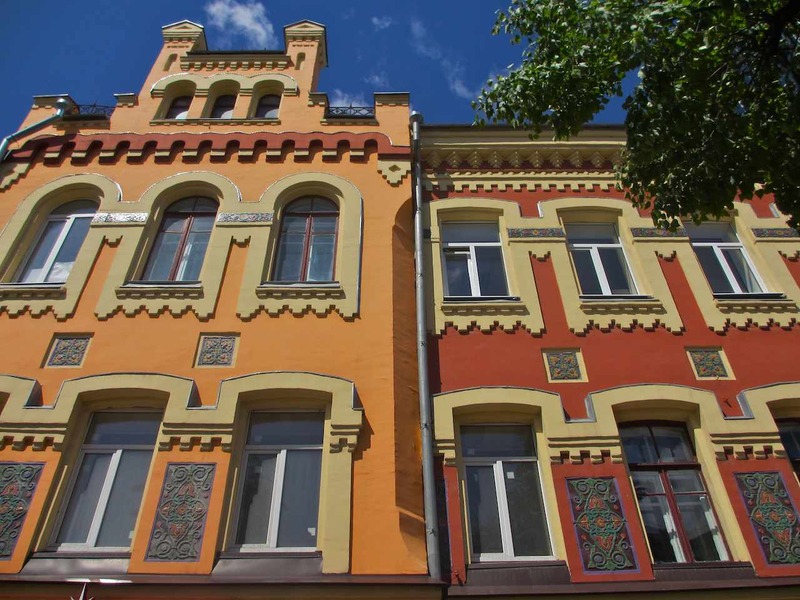 It’s a beautiful, happy structure with lovely, earthy colors, hispanic-looking mosaics, seemingly non-functional towers, and lacy window frames that look like they could be anywhere but in the middle of Russia. This is the former Central Hotel, where, after it was built in the early 1880s, most everybody who was anybody stayed when they were in town. 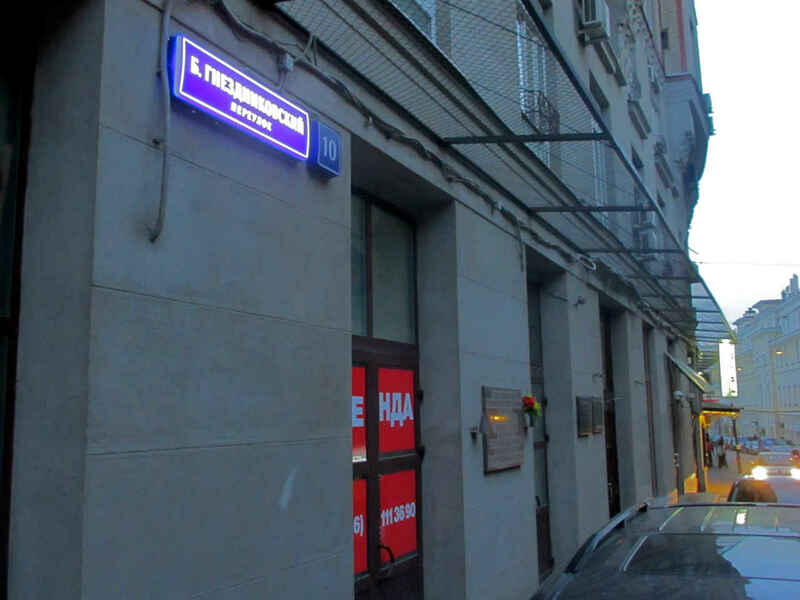 As the plaque on the street-side wall proclaims, the writers Gleb Uspensky, Anton Chekhov and Vladimir Mayakovsky all checked in here at one time or another. I can’t find much about Uspensky’s visit. Even a website devoted to the plaque itself provides no more information that the fact that he “lived here in February 1890.” End of that story, at least for now. Chances are he was here while traveling around the country collecting material for his essays and stories on Russian life. 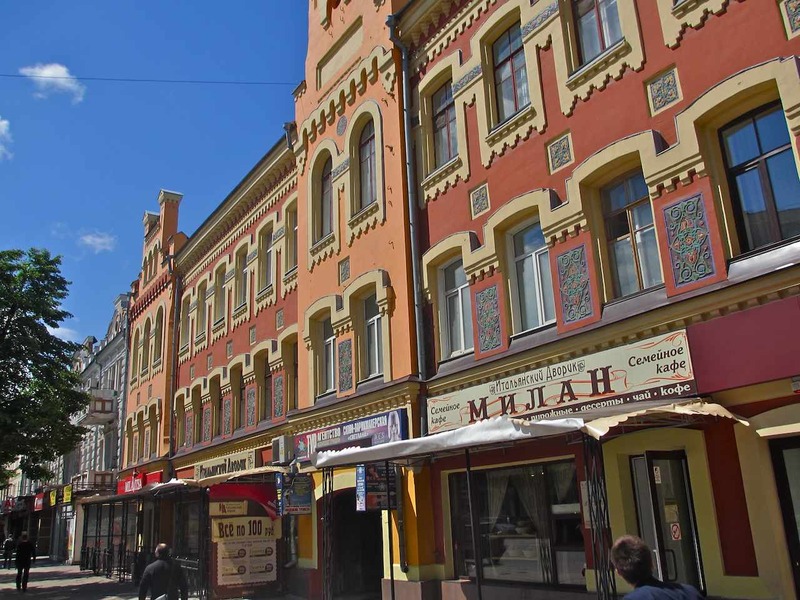 Elsewhere on this blog I write a little about his short stay in a hotel in Tomsk in the summer of 1888. Chekhov showed up with his friend and publisher Alexei Suvorin in tow in February of 1892. 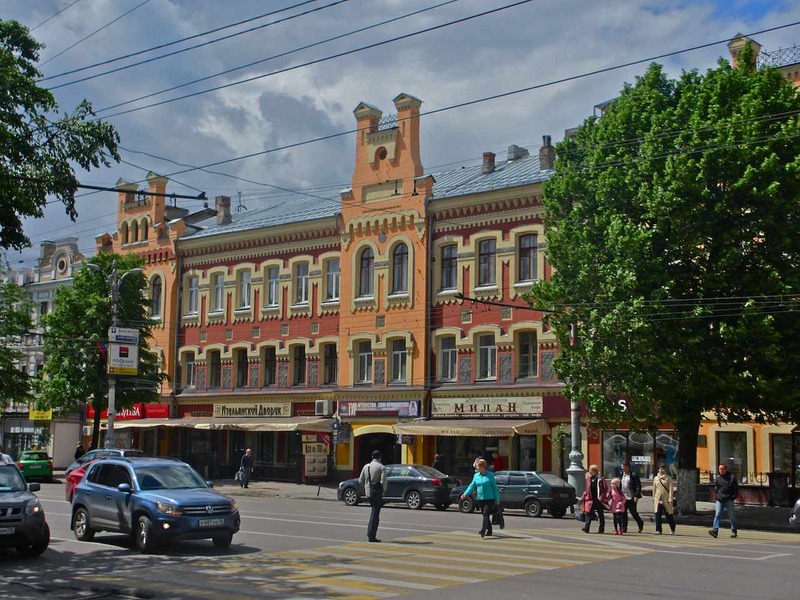 They spent five days here while on business in connection with Chekhov’s charity work. Based on letters published in that spectacular, blue, 30-volume collected works that every Russianist owns or wants to own, Chekhov arrived on February 3 and departed on the 7th. He was always active in fighting famines and epidemics. According to Russian Wikipedia, the Famine of Fall 1891 to Summer 1892 involved most of the so-called Black Earth and Central Volga areas of the country. It was kicked off by a bad harvest in the spring of 1891, and it quickly turned into a catastrophe, destroying the local economy and setting off problems with typhus and cholera. This, of course, is where Doctor Chekhov came in. He, along with another doctor-writer Vikenty Veresaev, were instrumental in getting help and medicine to the afflicted. Chekhov’s experience with this famine/epidemic found reflection in his story “The Wife,” published the same year that he was in Voronezh. The first note written by Chekhov on Feb. 3 is to local resident Grigory Lepnev. In it he states he will depart the next day for a trip around the region, but it didn’t happen as soon as the good doctor expected. On Feb. 6, he wrote to Yefgraf Yegorov, a retired officer in the Nizhgorod area, “The same thing happened that happened in Nizhny, which is to say, the governor invited me to dine and I had to speak, and listen to, much about the famine… Voronezh is filled with activity. The battle with the famine here is set much better than in the Nizhgorod region. They aren’t only giving out bread here, but also transportable stoves and coal. There are workshops set up and many cafeterias. 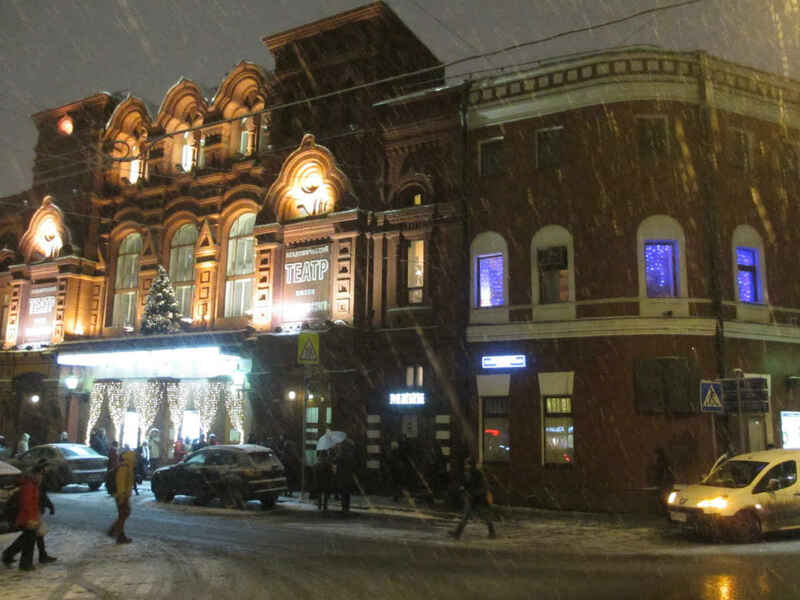 Yesterday there was a benefit for famine victims at the theater – the house was full.” Chekhov’s father and paternal grandfather, incidentally, were born in the Voronezh area. They famously were serfs there in the household of Alexander Chertkov, a well-known archaeologist, historian, book collector and publisher. 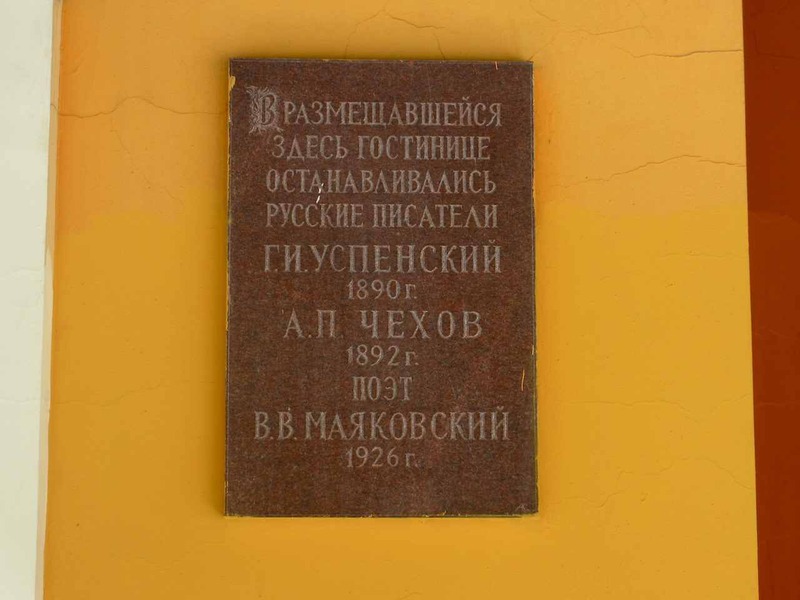 Mayakovsky appeared in Voronezh on the morning of November 22, 1926. 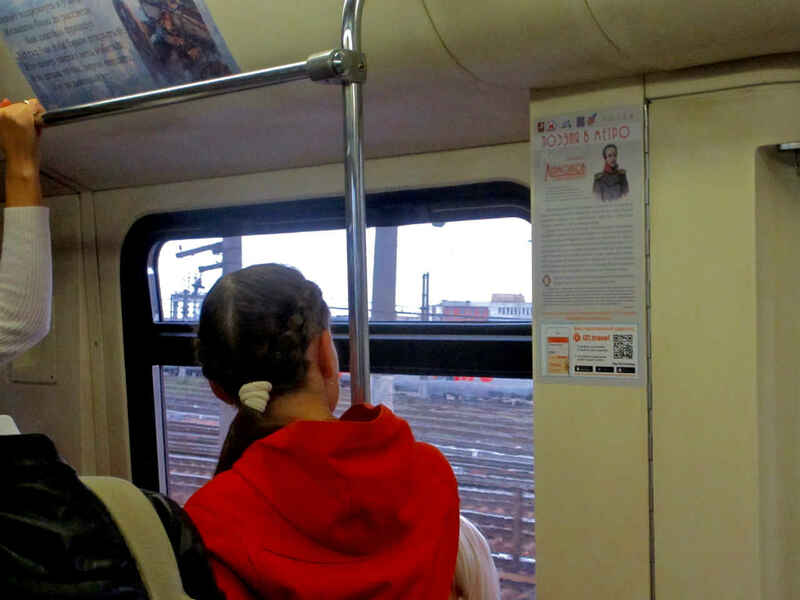 Thanks to a detailed description of his visit on the Communa website, we know that nobody met him at the train station and he made his own way to the hotel, where he met with Nina Logofet, a member of the local Black Earth writers group. She, apparently, was in charge of his schedule during his stay. That evening he appeared at a reading at the theater – I don’t know which one specifically. Mayakovsky delivered a talk called “My Discovery of America,” then spent “several hours in the company of his fans.” He did not return to his hotel room until dawn. Thanks to this meeting, the local poets Logofet and Vladimir Korablinov were soon published in Moscow in the literary journal New LEF. Mayakovsky promised them he would publish their work and he kept his promise. On November 25 the first public account of Mayakovsky’s visit appeared in the newspaper Voronezh Commune. 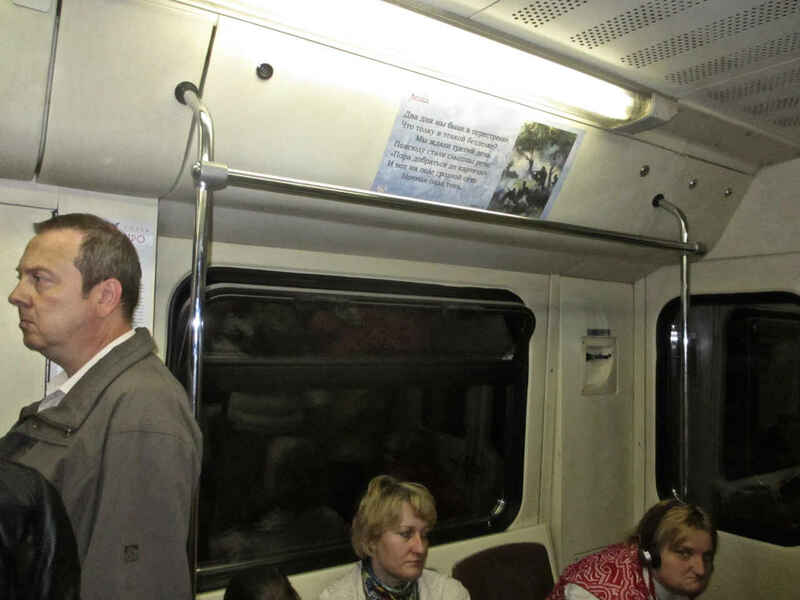 It was written by the poet Ivan Belyaev, a huge fan of Mayakovsky’s who recently had come to Voronezh from Estonia. For the record, Belyayev had less than a year to live at this point – he was arrested in the summer of 1927 and sent to prison in Moscow, where he perished. Mayakovsky himself was almost on borrowed time by now – he shot himself on April 30, 1930, in Moscow. That sad deed occurred in a building I have written about elsewhere on this blog site. You can hear Mayakovsky himself read his poetry by going to the very cool openculture website, which has two audio links to Mayakovsky reading his own work, as well as a link to a video of the 1918 film The Lady and the Hooligan, in which you can see Mayakovsky act. In the final photo below you can see an old photograph of the hotel taken, I assume, at around the turn of the century. It looks very much like it does today, aside from the garish advertisements on the street level. I took the photo of the photo in a marvelous basement cafe in the old building. 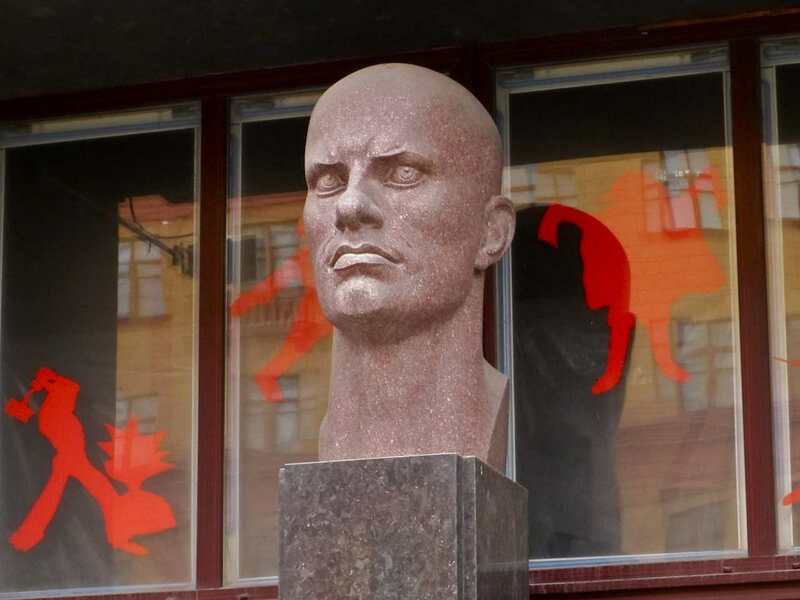 This bust of the poet Vladimir Mayakovsky is very powerful. 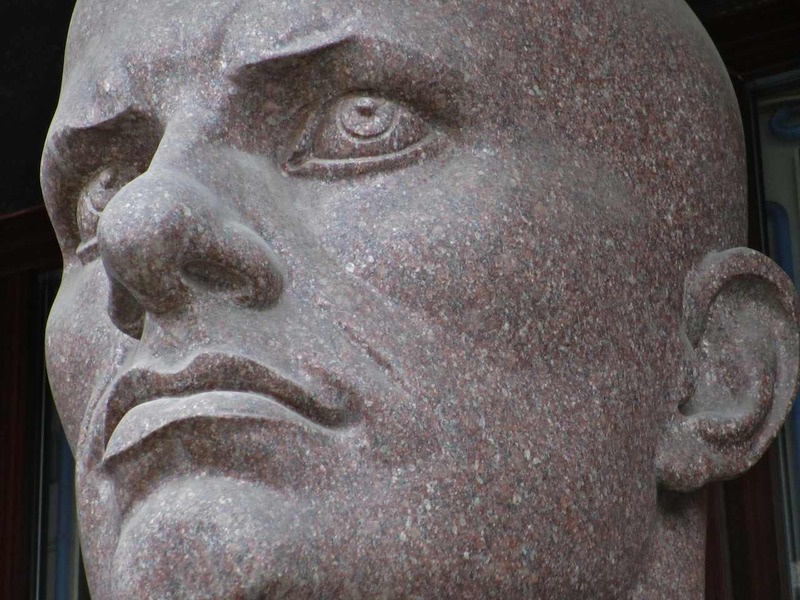 It presents the “great Soviet poet” as a most contentious and threatening force. 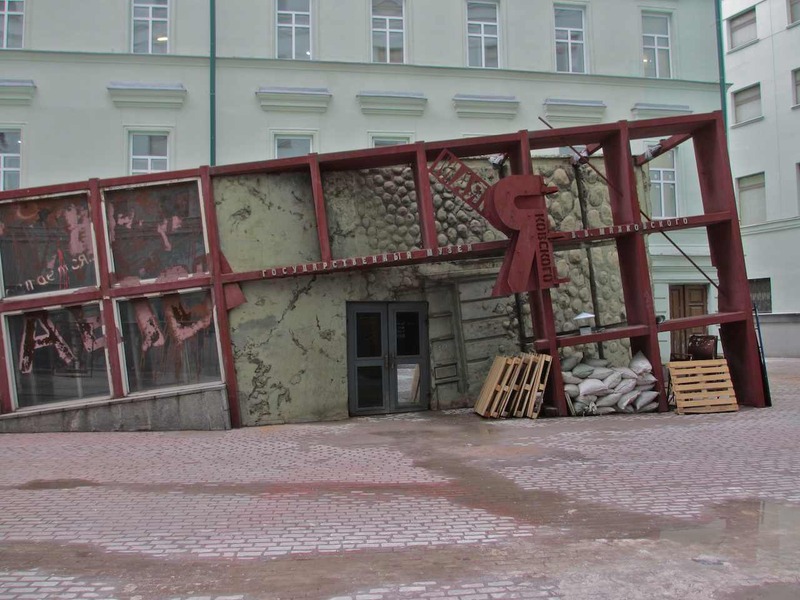 Unveiled in 1993 near the entrance to the Mayakovsky Museum right across the street from the Lubyanka – where many of Mayakovsky’s friends were incarcerated or murdered – this image is one that shouts reproach. 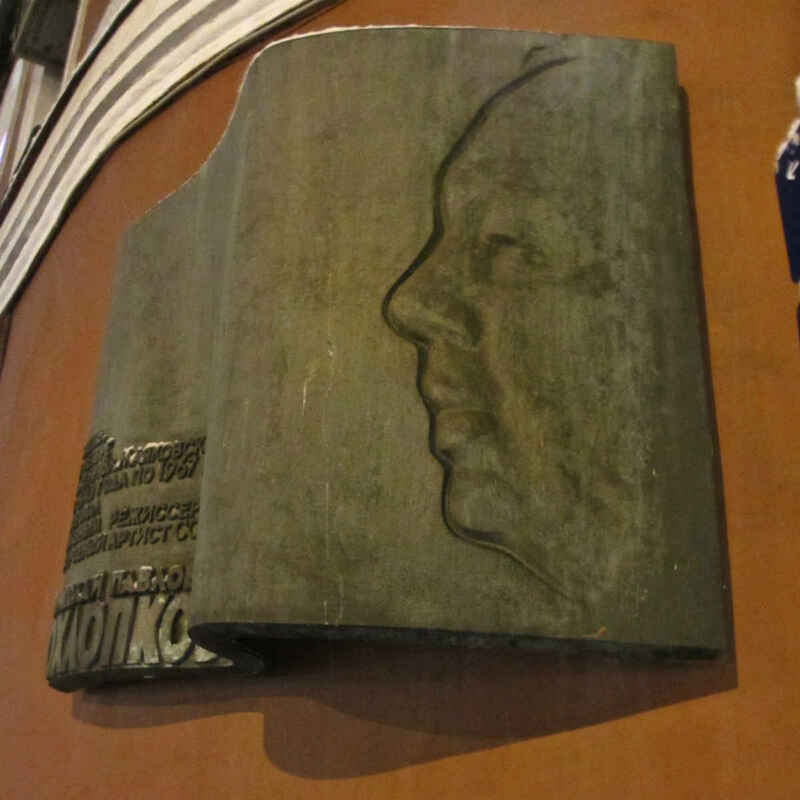 Surely it was planned by sculptor Yury Orekhov that Mayakovsky’s gaze would be averted away from the headquarters of the GPU/NKVD/KGB/FSB. 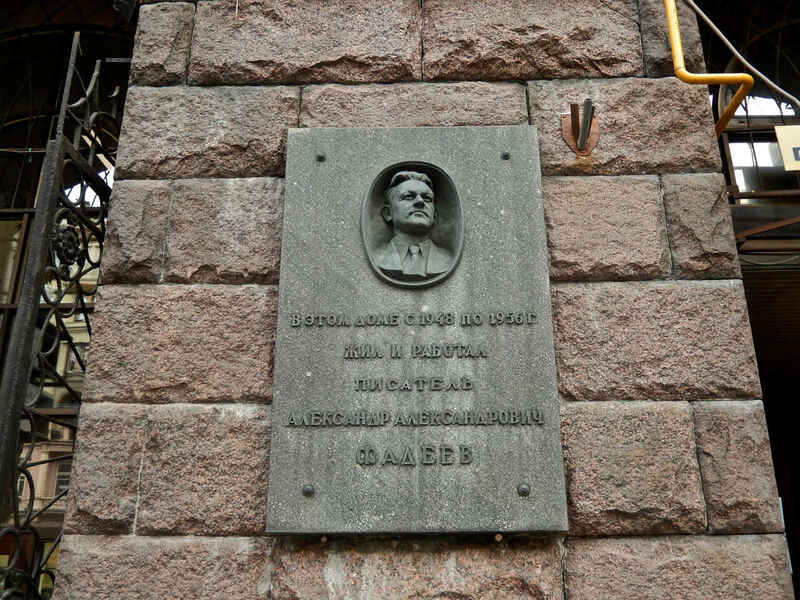 Even in 1993, one of the most liberal periods in Russia, I don’t think it would have been tolerated for this gaze to be aimed at the walls of the building where Mayakovsky’s friend, the director Vsevolod Meyerhold, was murdered in 1940. Of course, Mayakovsky himself did not live to know about Meyerhold’s murder. Experiencing unbearable pressure in both his personal and public lives, Mayakovsky took his own life by gunshot on April 14, 1930. Well, I’ll be damned. That was 85 years ago today. I didn’t plan on that. It happened on its own. Mayakovsky, as Boris Pasternak said with such insight, suffered two deaths. One occurred when he left this mortal coil; another, when, in 1935, Joseph Stalin, giving orders to NKVD head Nikolai Yezhov, raised the dead poet to the status of state hero. Mayakovsky could not possibly have been a Stalinist hero. It doesn’t matter that he wrote no small amount of poetry extolling the wonders of the new Soviet state. That was an honest desire on the part of the poet to believe that change, of which he had dreamed, was indeed bringing forth good. The problem was that the rift between the rhetoric and reality of the time was growing too big. The crimes and evil being done in the name of progress were killing people. Indirectly, but no less effectively, they killed Mayakovsky, too. 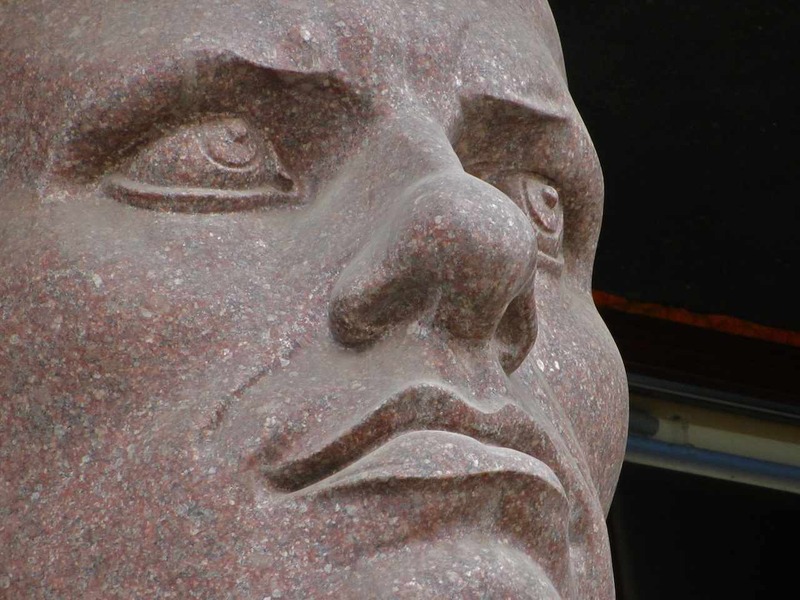 You see most of that in Orekhov’s bust. You see anger, you see rebellion, you see power and strength and talent and you see, somehow, in this red marble, a terrible vulnerability. I can’t find it specifically. I can’t say, “Look at this picture and look at the eyebrow or the earlobe and you’ll see it.” It’s not there to be picked out and set aside. But it’s there. In this bulk of rock, with its hawk-like gaze, you see loss and failure and deception and the treachery of history weighing it down. Maybe it’s the anger – maybe that’s too much anger for a human to bear. Mabye that’s where the fatal flaw lies. In anger. 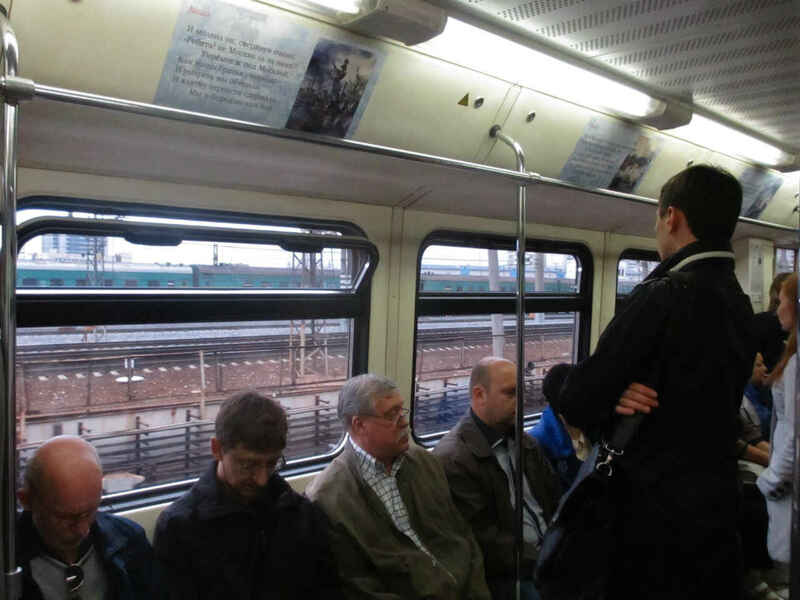 Those of us in Russia again live in an age of animosity and anger. In ways that parallel only the times of Mayakovsky, we have seen the field of culture become a battle ground. 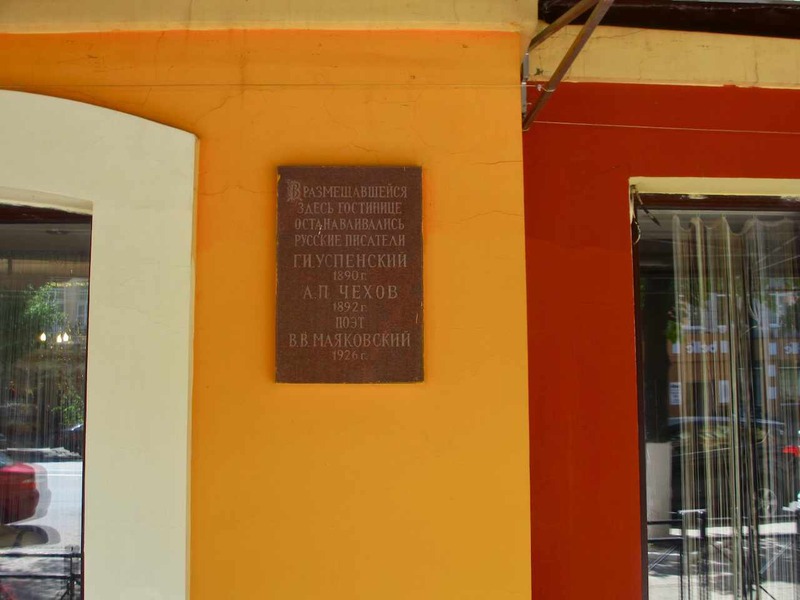 That has touched on Mayakovsky’s legacy even in regards to the famous museum that once marked his life and work in this world. It is interesting to see how changes at the Mayakovsky Museum dovetail with the advancement of history. 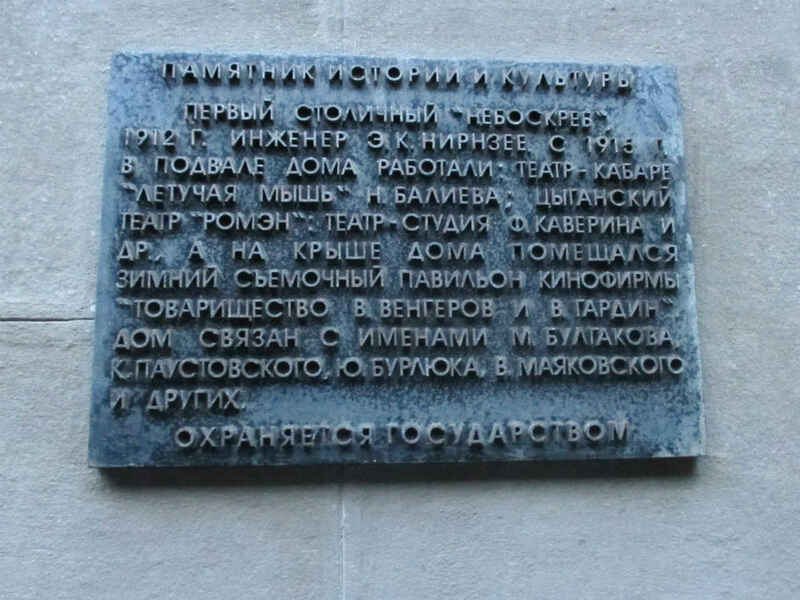 The first Mayakovsky Museum, a predecessor to the one we now know, was established at a different address in 1937, during the height of the Purges. 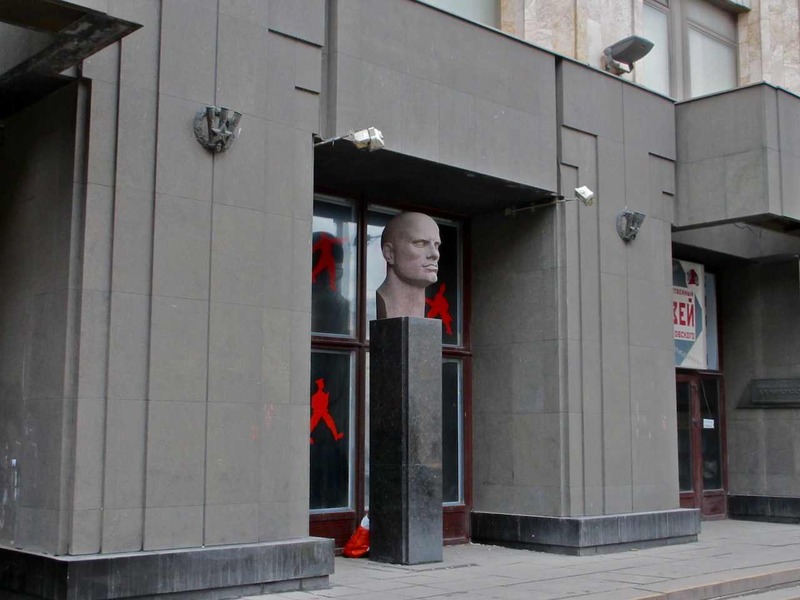 The current museum was created in 1967-68 in the building where Mayakovsky shot himself. History buffs recognize this as the tail end of The Thaw era. Major reconstructions were undertaken in 1987-89, the height of Perestroika. 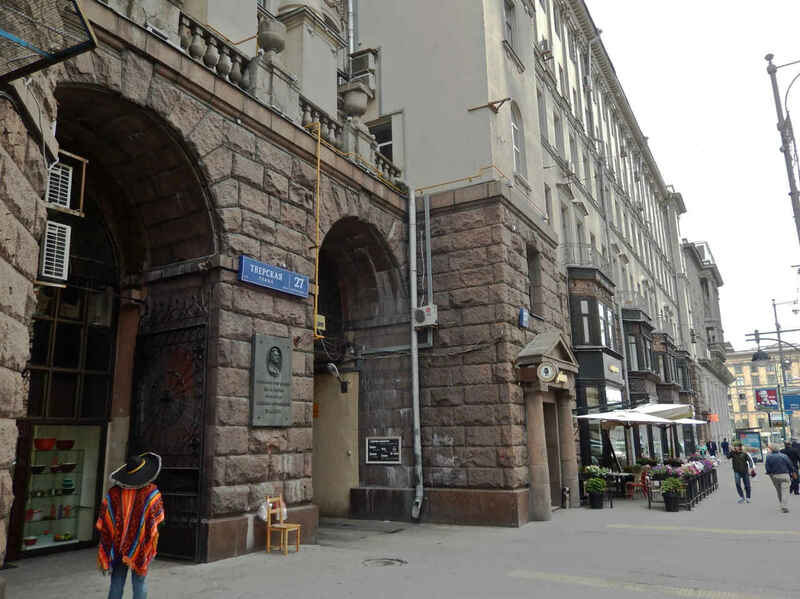 The museum was closed and its exhibits were partly vandalized in several scandalous moves by the authorities in 2013 – the beginning of the period in which we now live, filled with cultural attacks, raids on places of culture and the plundering of art, past and present, for money and power. Just as Stalin was necessary to bring Mayakovsky back into the ranks of hero following his suicide (a real no-no for Soviet propaganda’s sake), Leonid Brezhnev was pulled into conflicts that affected the fate of the museum in the 1960s. 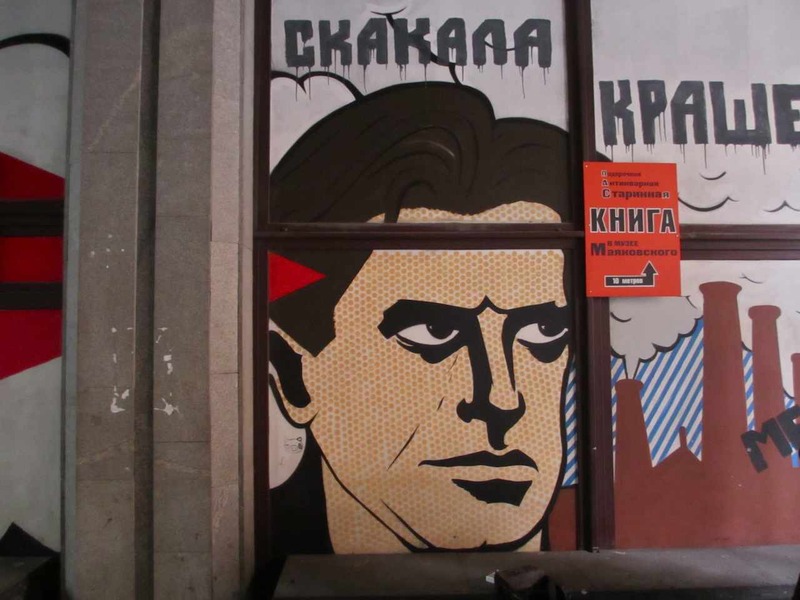 My point is that Mayakovsky and his legacy continue to act as a kind of litmus test determining which way political and cultural winds are blowing. As you can see in the photo immediately below, the museum is now abandoned and “under reconstruction.” There is no way of knowing what form the museum will take in the future, just as there is no way of knowing where all the cultural conflict in Russia today is leading us. 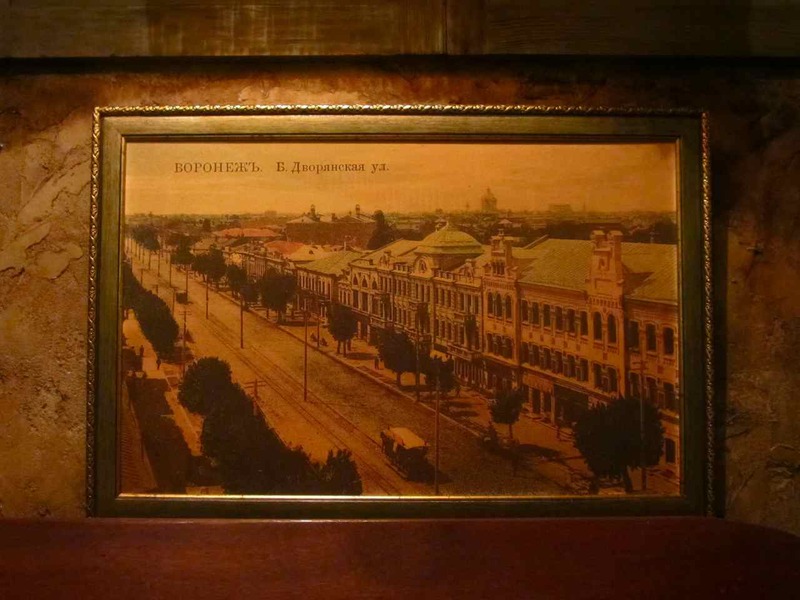 One can expect that, wherever it leads, it will be reflected in some way in the Mayakovsky Museum. In the final photo below you see the plaque identifying the museum on the inside of the archway that leads to the museum entrance. 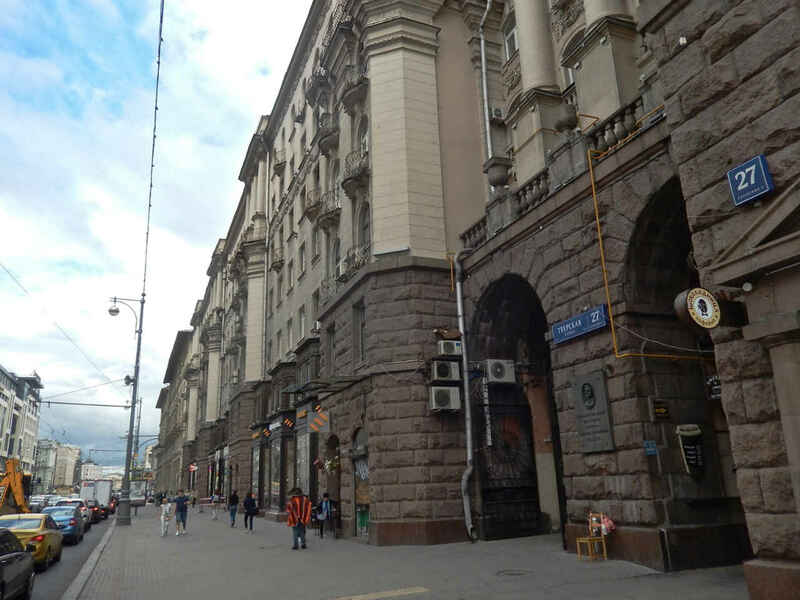 Beyond it and across the street stands the FSB headquarters at Lubyanka. There is a symbiotic relationship here that feels eternal, whether we like that or not.